I guess I could go on forever, so I’ll stop there. The bottom line, is that I’m back for a while to help the CPUN, and AW if you will have me. I think the Aqua Warriors could have a real chance at rebounding from our past shutdowns and slowdowns and I want to be here to help get us there. I would like to see some interaction on this website with AW members, or friends, and some more frequent activity. I updated the site header, and I am working on a new background. It probably won’t be to drastic, but maybe a color change to match the header more. With more activity going on here, we’ll get more attention from others in the army community, and then the soldiering part will come more easily. First, we have to achieve the busyness that is required. More chat interaction is a good start as well. As an added bonus, if I see anyone on chat or commenting frequently on this site I will be the first to promote them. That also brings up the topic of ranks…. Right now, they’re old, outdated and obsolete. So, I’ll save a copy of them, then erase it all. Comment if you want a place on them, and I’ll begin filling them in with current members. Hope this wasn’t too long to bore you. Thanks for reading, if you did. 6 Way Battle for CPUN’S #1 Army! iTunes Contest! Layne Edit: Contest ends in two days, I will pick the winner at noon on Tuesday, but if the winner is nonexistent, or only has one recruit, I will not be awarding the iTunes gift card. Elimz Edit: I cannot come due to camp. So Layne can fill it up. But if Layne or Aan or no owner is there, I assigned some moderator ranks to take over so listen to them! Wednesday night, I will check who came and give them promotions and a party or even the video I was talking about! But if you cannot come without a decent reason, like you forgot, you will be DEMOTED. If you say you will come but you don’t you will be still DEMOTED. Guess what! The Aqua Warriors have been chosen to participate in the 6-way practice battle that will determine who the top CPUN army is. Six of the main and most active CPUN armies have been chosen (including us!) and will battle it out on Wednesday, December 29th, 2010 for the title! As I said, we will be battling for this MOMENTOUS title and if we win, will be super EPIC! Of course we are already epic 😉 but this would really get us a lot of attention and recognition, probably more recruits too. So I want everyone to come to this. We can have 5 people easy at a battle, 10 people has been tough to get sometimes, but I think we can pull off 15 penguins on CP for the battle! That is the minimum number of AW troops who need to be there for us to have a chance of victory! So please ask your parents, call your boyfriends and girlfriends, tell your neighbors, to CANCEL ALL PLANS NEXT WEDNESDAY! We need you soldier! We need every person we can get! Soo…. I propose a little contest. Do you guys like iTunes gift cards? Well I have a $10 iTunes gift card that would love to be given to a lucky winner. Want to know more about how you can win some moolah? Alright soldiers! Let’s get to work! Aan10 Edit: We need to be more active on our chat. I would love to go on every afternoon and see people on there talking! If I happen to come on this week, and I see you, you will either get a promotion or a couple medals depending on your rank. I don’t like to see an empty chat! Do you want to make some good friends and improve cooperation? Go on! 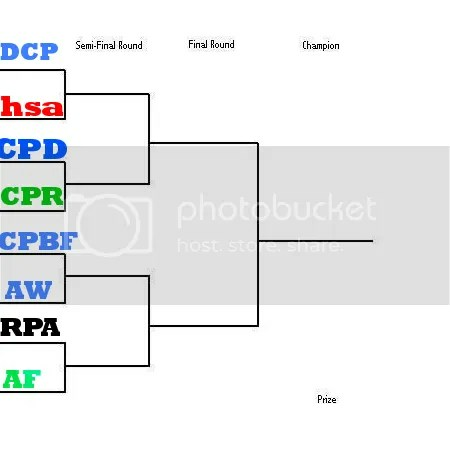 The second CPUN tournament battle will be under way on Wednesday between CP Defenders and CP Rangers. It would be a good idea for any AW troops to attend (in “civilian clothes”) to observe the battle. If you go and take a picture of you during the battle, I will award medals. Remember, medals can earn you all sorts of prizes, including a promotion! So attend the battle to get a little refresher on CP warfare before our battle with the CP Blue Force. I will be out of town on Friday and Saturday, so I am trying to arrange our battle with CPBF to be on Thursday or Sunday. If not, Soundbooth or the next highest ranking officer may lead. I expect to be there otherwise. Please comment and let me know what day works best for you. Thursday? Friday? Saturday? Sunday? Comment! Here is the CPUN tournament bracket. We will be battling the CP Blue Forces first. I expect us to win this first round for sure, do not dissappoint me. The time for our battle is to be announced. Check here often for any more news and updates. THe old AW site was hacked everyone! This is the new site! Wow. I was speechless when I came on today and saw the AW site deleted. This will be the new one. It will take a long time to build back up to our full potential again, but it is possible. I will work hard to restore AW to it’s rigthful glory. Please be extra active and extra careful as I and all of AW tries to figure out who and why this has happened.